It has been absolutely ages since I made any felt. I was feeling so guilty because jewellery making and creating with polymer clay had totally absorbed any creative time I had. People kept asking whether I had made any felt and every time I answered in the negative, the guilt crept up on me again. However, when I finally got round to making some felt, last week, I realised how much I had missed it. So, the piece above is in its pre-felted and fluffy glory and is made from wool from my sister's sheep with Lincoln Longwool (the wiggly white wool) on the top as decoration. 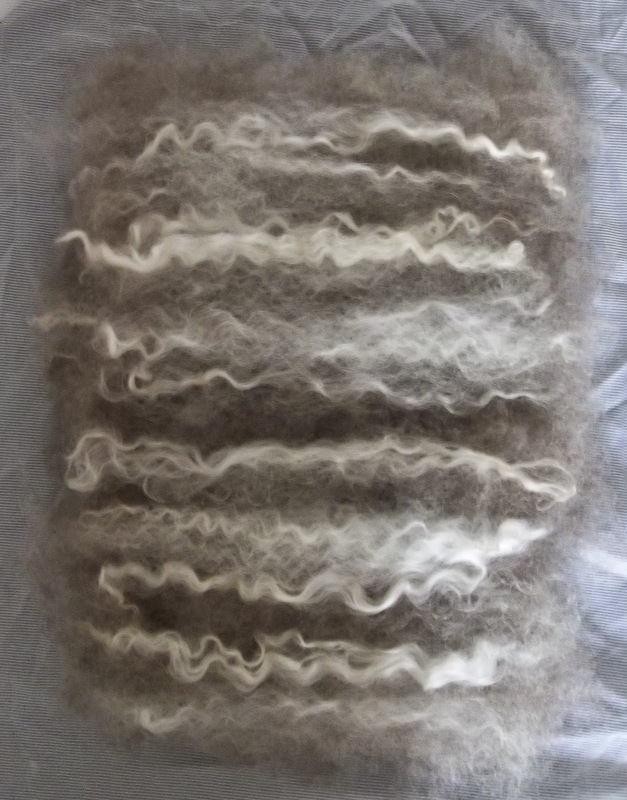 It was the first time I had used Lincoln Longwool, and it was lovely! 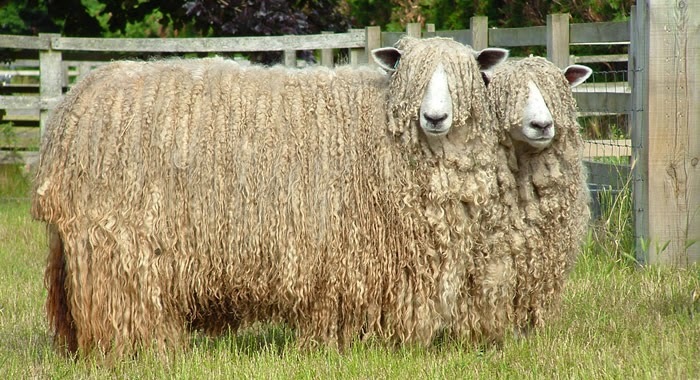 Just in case you wondered what the sheep look like, here's a photo from the Lincoln Longwool website . How they can actually see where they are going is a bit of a mystery, but they do have lovely fleeces. All the wiggles stayed in the wool, which I was pleased about, because one of the joys of felt making is that the wool does decide how it is going to turn out, despite the maker's best efforts to persuade it otherwise, so you can never be totally sure how it will look once felted. This piece is going to be cut up and made into something for one of the blog swaps I am signed up to, but I will share the finished article with you once the item has arrived with my swap partner. I am going to start felt making again more regularly - I really enjoy it. LOVE your felt - and those stunning sheep. I imagine that wool gets very heavy (particularly if wet). It must be a relief for them to be shorn. Thanks, EC. 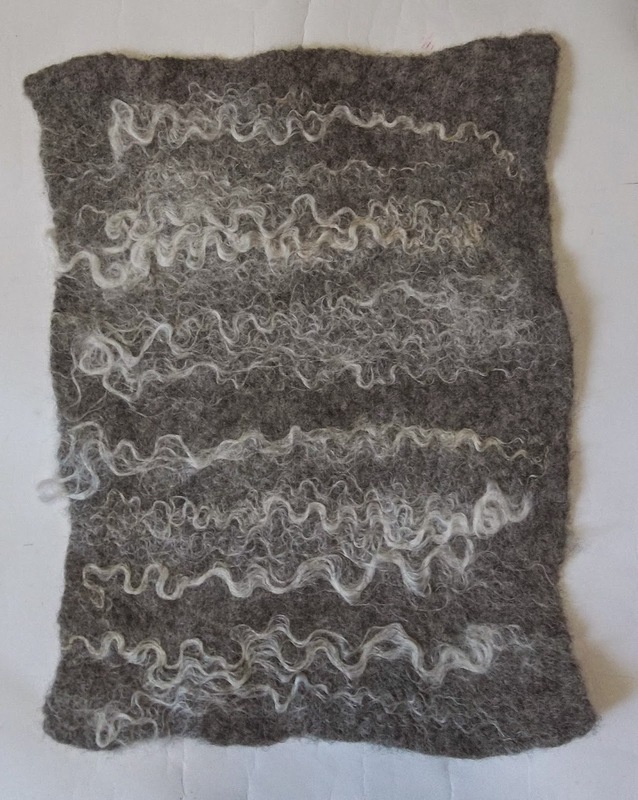 I was really pleased with the pattern on the felt made by the Lincoln Longwool, I'm sure the sheep are hugely relieved to be without their fleeces during the summer. I am thinking of buying some more of their wool - it does felt well. I know that feeling well. 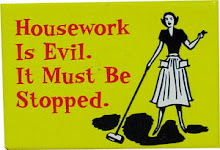 I do so many crafts that I feel guilt about the ones I haven't done in a while. Bit daft when I think about it... those sheep are so cool! The sheep are great, aren't they? Thanks, Alison. It is great to be able to use local wool and I agree, it is great to get back to a favourite craft. I always feel a bit sorry for sheep before they are sheared, although wool does seem to adapt to temperatures, so it would be nice to think they don't get too hot. Thanks, Amy. I do too! Those wiggles look so nice! I would love to have a sister with sheep too, but she lives in a flat ;-)... Love from Mirjam.